This is a post that no matter how many times I start it, I never seem to get past the first paragraph. Hopefully some sense can be made of the thoughts I hope to share. 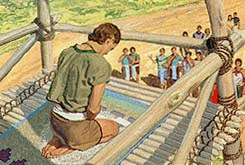 The events surrounding this post revolve upon the words Nephi (son of Helaman) speaks while praying upon his garden tower. Oaths between man and God are sacred. Oaths between man and man are to be made with great caution, if made at all. Add a condition of "secrecy", and there is serious potential for danger, no matter how well intentioned the participants may be. Those involved in oaths between two or more mortals will lie to defend their secrets, or try to deflect the question onto those revealing their secret. There is a clear position of defensiveness. In the case of Nephi, praying on the tower, the crowds came, and he boldly and openly shared details of the people's secret works of darkness. (Helaman 8:4) (Consider what made them "dark"?) Rather than internalizing the words of this bold prophet, those involved tried to rally the people, accusing Nephi of reviling their laws and judges. They went so far as to bind, imprison, and try him before the judges, because he revealed their secret oaths. Beware of secrets, and secret combinations. Additionally, I have learned to beware when someone wants me to keep their secrets. If someone claims their secrets are too sacred for you to share with another soul, then they shouldn't be sharing with you in the first place. 2nd observation. Nephi is given serious, serious power. It is not common to see such power bestowed upon a man in the scriptures. Power is given, but rarely do we see such details. Why? Nephi didn't fear the people, and he didn't seek to save his own life. He was willing to do whatever it took to do what God needed done. He kept the commandments of God. It's likely that he kept them with as much exactness as possible. A point not added in these verses, but that I feel is important: Nephi didn't do all this to exalt himself, to gain power, or praise of men. He didn't seek to be popular. He was simply doing his best to lead his fellow man to Christ, and I believe he was full of charity. Because of all this, comes my 3rd observation, which is a description of that power received. He was made mighty in word. He was made mighty in deed. He was made mighty in faith. He was made mighty in works. He was made mighty, so that all things he declared would come to pass. Why? Because he would not ask for anything contrary to God's will. The Lord then goes to explain the extent to what power Nephi has, in great detail. We even learn that he is "conveyed" in the Spirit, out of harm's way (Helaman 10:16). Can you imagine that? It is truly fascinating. Amazing. And this is all bestowed upon a mortal man. (Or at this point, was he? :) Wow. I wonder how many friendships would not be damaged if everyone followed these simple rules? Oh, isn't that the truth, CAK? I think it would affect whole societies. Could you imagine, if within any organization - churches, government, charities, schools, if everyone did so? Wow. There would be no corruption, no swindling, no backbiting. Such a wonderful idea!